Is pulling on the leash good for German Shepherds? 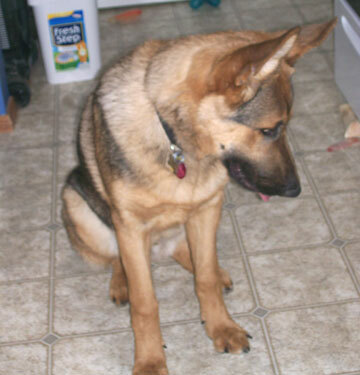 I let my 14 month pure-bred GSD pull on his leash because I was told that it will build up strength in his legs. He has nice muscular legs right now. If it is good for him, I don't mind the trouble. I have this no-pull harness but I have not used it on him yet. Maybe I might use it when he gets too strong for me to handle, I might switch over to that. Right now he is 32 kgs (71 lbs) and 26-in tall. 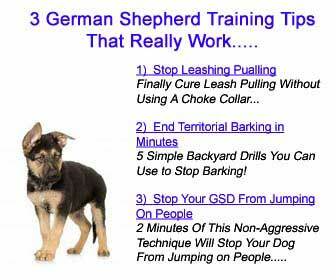 Comments for Is pulling on the leash good for German Shepherds? I think both of the above methods have their place in training a dog to "walk on lead" or heel. For a puppy, too young yet for formal training, try using a long-line held loosely, then being a tree when the pup gets ahead of you, when the puppy is stopped by tension of the held line, get the puppy to look at you while you change direction, With the change in direction encourage the pup to follow. To keep doing this shows the puppy he will not get anywhere by charging ahead but that following you on a loose line can be pleasant. For an older more mature dog where a closer heel is desired use the choke, initially with the long lead. Just before the dog reaches the end of the line, give the lead a good jerk and immediately change your direction. The choke correction teaches the dog to stay right next to you and pay attention to where you are going and to follow closely. I would suggest that rather than "be a tree" you use a long training lead and a choke collar. When the dog gets ahead of you (out of heel position) you stop, but just before the dog runs out of lead line, you vigorously snap it back, effectively giving correction by tightening the choke (be sure that the choke is on correctly to begin with or it is useless. With a big dog like a GSD you might even resort to using both hands/arms on the lead to provide enough snap back to get your dogs attention. Keep doing this every time he strays away from the heel position. Do not pull, or tug, the dog is probably stronger than you. Eventually, the dog will learn that in order not to receive the correction he needs to be right beside you at the heel position. At that point, start using a regular length lead, held loosely by you. A reminder once he is heeling correctly, is for you to turn sharply with your knee up preventing him from foraging ahead of you, if he should try to get ahead of you. Thank you for the suggestion "Be a tree". My 12 month old GS was behaving quite well on walks. But in the last week he has got out of control. Today he pulled me over when he saw a cat. It could be the routine disruption over the holidays?? I tried sitting him all the way along but stopping does seem to work although it's a slow process. I suppose if you don't mind being dragged into the street, or yanked off your feet, or having a dog control you vs you being the leader, then pulling is fine. Seriously, the issue is control. If he stops pulling when you ask, great, but I have never heard of using pulling to develop muscles. A good rousing game of fetch, or a good run is much better. GSDs need a strong, firm, gentle leader or they will take charge which can result in a dog with a lot of behaviour issues. My guys walk on a loose leash, not necessarily a heel, and when we get to the woods/river/ocean, I decide they can be off leash for a fun romp, & I decide when it is time to go back on leash to go home. To fix the pulling try the "be a tree" technique. Start off walking and as soon as the leash gets tight, stop and plant your feet. Tell your dog to "come" and as soon as the leash slackens give a ton of praise & a treat when he comes back. Then repeat. You may only make it a few feet at first. Keep it up though, and in time he will see that being beside you equals good things & pulling means walks stop. Good luck!